Ashish Nehra may have hung up his boots from cricket but his love for the game couldn’t keep him away from it for too long. Just a few days after his retirement, he makes a comeback and this time, in the commentary box. The former pacer will be joining the likes of Virender Sehwag for the Hindi commentary panel from the first Test between India and Sri Lanka at the Eden Gardens, Kolkata. Star Sports, the official broadcaster of the series, announced the news on Twitter with a video of Nehra’s interview with Sehwag in his final match where the duo discussed the pacer’s plans after retirement. 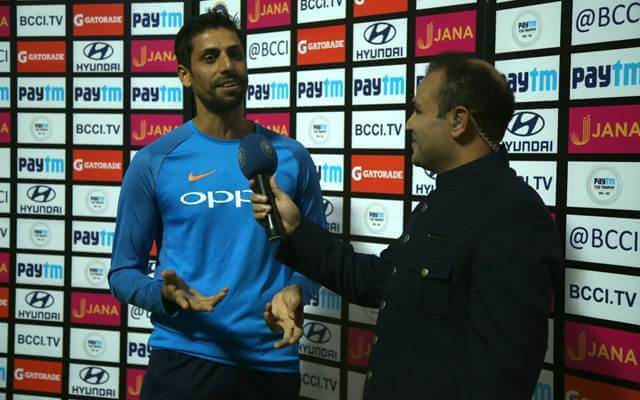 Nehra mentioned that there are several ways in which he could stay connected with the game and commentary was one of them. It will be a treat for the fans to hear the duo together in the language that they both express themselves the best in. Sehwag is known for his witty comments and so is Ashish Nehra and hence, it will be like a cherry on the top while enjoying the cricketing action. Nehra had recently called it quits from the game after making his last appearance for the men in blue in the 1st T20I against New Zealand. After he was picked in the T20I squad, he had expressed his desire to retire on his home ground of the Feroz Shah Kotla in Delhi. The selectors agreed to his wish and the Indian team gave him a grand farewell to mark the end of an 18-year-old career in the game.